Ever have that nagging feeling that you have forgotten something … something kind of important … something with a deadline? All week I have had that very feeling. I thought perhaps this was the week to write this column, but no I didn’t have it written down in my lesson plan book, so that definitely couldn’t be it. Today as I sat down to do lesson plans, I took out my calendar to check the upcoming events for next week, and there in big letters across this week were the words “Write column.” Sigh! Unfortunately I need to finish this tonight and my trusty proofreader, a.k.a. our secretary, has gone home for the night. This column will have an extra feature, a built-in game. Yes, as you read see how many typos you can find! I do have an excuse for my forgetfulness. For the last two weeks my students have had standardized testing. The first and second graders took the IOWA test last week and this week the second graders took the CogAt test. The older students took their tests online and the results are already in. The kindergarten through second grade took their tests “old school” and we are waiting for a few children to make up some parts of the tests so we can send the tests in for grading. I believe there is some cosmic rule stating that no matter how healthy a group of children is, no matter how low the absentee rate has been, the minute we begin the IOWA and CogAt testing great waves of sickness descend upon the school. I kid you not. On the first day of IOWA testing, three of my nine second graders were sick. The eighth graders sponsored a book fair. It opened Monday, March 11, and continued through Sunday, March 17, which was also the date of the eighth graders’ annual St. Patrick’s Day Breakfast. The breakfast featured Chris Cakes. The menu consisted of all-you-can-eat pancakes, Winner’s sausage, and beverages. The outstanding feature of this breakfast was that the pancakes were not placed on a plate, but rather flipped through the air so you could catch them. However, there were eighth graders available to catch the pancakes for the faint of heart. I have actually discovered the secret to catching the pancakes … just stand still. Chris has a pretty good aim. The proceeds from the book fair and the breakfast will go toward the eighth grade’s class trip. This year they will travel to Baltimore, Maryland, with a side trip to the White House. March 5 was Mardi Gras. My class made the traditional Mardi Gras masks covered with enough glitter and feathers to double as parade floats. In fact, even though as I write we are ready to start the second week of Lent, I still have glitter and the occasional feather floating about. Staff and students wore Mardi Gras beads and enjoyed a treat of King Cake, which is basically a giant sweet roll with a thick layer of icing sprinkled with several pounds of yellow, purple, and green sugar. At the end of the day, we “buried” the Alleluia. Each class had made an Alleluia banner that was carried in a procession to the church basement. The banners were “buried” in the basement as a sign of setting aside the joyful in order to enter a serious and somber time of repentance. After Lent the Alleluia banners will be “resurrected” and hung over the classroom doors to greet the students when they return from Easter break. We are attending the Stations, or Way of the Cross, on Fridays during Lent. The Stations are a special prayer service during which we remember Christ’s passion and death. The service is led by the eighth graders. The Stations begin at 1:30 p.m. and last for about 20 minutes. You are more than welcome to join us at St. Mary’s Church in remembering Jesus’ sacrifice for us. Well I have just read over this column and I think I have caught all my mistakes. I just used spell check and caught a few more. So let’s see what you can find. Pencils ready … set … GO! 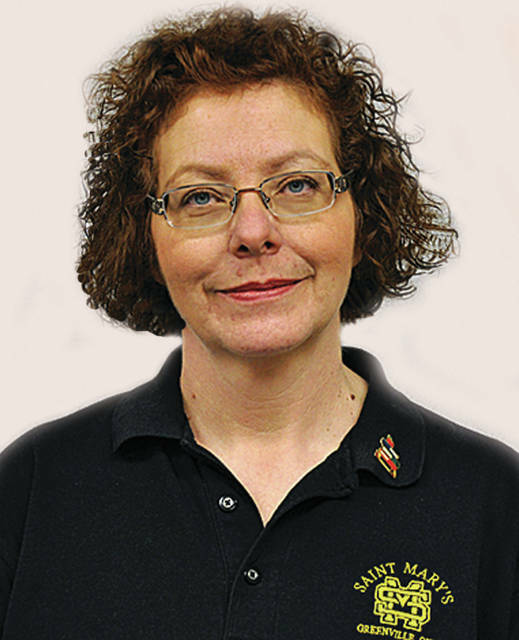 Kathy Ayette is a teacher at St. Mary’s Catholic School. She can be reached at kathyayette@swohio.twcbc.com. Viewpoints expressed in the article are the work of the author. The Daily Advocate does not endorse these viewpoints or the independent activities of the author. This entry was tagged Opinion, St. Mary’s News, St. Marys. Bookmark the permalink.